Many plans can offer awards in the form of options. 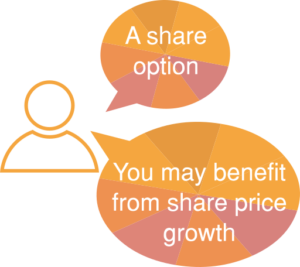 If the plan is called a Share Option Plan, then usually it means that you are granted a right to acquire shares and the exercise price you have to pay for each share is based on the share price at the date of grant, or the market value. You choose whether to exercise your option. Occasionally, a company may grant a stand-alone option. The terms are in the option document itself and there are no separate plan rules, but otherwise the principle are similar. Let’s say the company’s shares are worth £1 a share. You are granted an option to buy 100 shares. To exercise your option and buy all of the shares, you would have to pay £100. If the share value has risen to £3 per share at the time you can exercise your option, you could get shares worth £300 but you would only have to pay £100 (and any employment taxes that are due). But if at the time for exercise the share price has fallen to 50 pence, it would not make sense to exercise the option. You would be paying £100 to buy shares that are only worth £50. You might hear people talking about the option being ‘under water‘. Certain special kinds of option plans offer potential tax advantages. Click on the links to find out more about these types of plan: SAYE, CSOP and EMI. The company should tell you if your option is under a tax-advantaged plan. Whether and how the tax advantages actually apply depends on whether, in the particular circumstances, all of the conditions for tax-advantaged treatment are met. This page is about Option Plans that do not offer tax advantages. Sometimes people call them ‘unapproved’ plans. There are no detailed tax conditions to satisfy, so the company can design the plan in the way that best suits its commercial situation. Therefore one option plan might be very different from another. Sometimes a company may want to offer more than the CSOP limit allows. So they may grant as much as they can as a CSOP option and grant the rest as a non-tax-advantaged option. An Option Plan normally says that options must be granted with an exercise price which is equal to or exceeds the market value of a share at the grant date. The options therefore only provide a benefit if the share price increases between the date of grant and exercise. However some plans might allow the company to grant options where the exercise price is below market value. You might hear these being called ‘discounted options’. You might also come across nil-cost options. Nil-cost options can never be ‘underwater’, but in other ways they are like normal options. A plan that allows the grant of nil-cost options is likely to be an LTIP or a Performance Share Plan or a Restricted Share Unit Plan (although the actual plan name may be different). Click on the links to find out more about these types of plan. When can you exercise your option? The rules of the Option Plan will say when you can exercise your option. Once the various conditions have been satisfied, you can decide whether to take your shares by exercising your option (or not). Exercising an option counts as a ‘dealing’ even if you don’t see any of the option shares, so you may need to consider your company’s share dealing code. The exercise period might only be quite short. Make sure you don’t accidentally miss the deadline! There may be employment conditions: the option may only be exercisable once you have worked within the group for a certain length of time after the date of grant. Or the plan rules, or the terms of your option, may say that performance conditions have to be met before you can exercise your option. What are the shares worth? If the share price is above the exercise price you have to pay, it will usually be worth exercising your option (although there’s no guarantee the share price won’t fall after you have exercised). If you have a nil-cost option, it would be unusual not to exercise it, because you get shares that you don’t have to pay for. If you have an option with an exercise price that is higher than the share price at the time, then you may be able to get the shares cheaper by buying them on the market (if they are publicly traded). In most circumstances, it would be strange to exercise an option when it is ‘under water‘, because you would be buying the shares for more than they are worth. When to exercise your option? This might depend on your tax position. It might depend on when you will be able to sell the shares you get. It might depend on when you have the money available. Sometimes it might be better to wait until the next tax year before exercising, for instance if for some reason you expect the tax bill will be less. But bear in mind that the share price may move up or down while you are waiting. Can you sell shares if you need to? Unless you have some spare cash, you may need to sell at least some of your shares to pay the exercise price and sort out your employment taxes. Sometimes, the company will offer a cashless exercise. This means that rather than you finding the cash to pay the exercise price out of your own pocket, you agree they can sell enough of your option shares to pay the option exercise price (and the employment taxes that become due) and deliver the rest of the shares to you. This is sometimes called ‘Sell to Cover’. Sometimes the company may offer the choice to sell more of your option shares if you want to. If the company’s shares are publicly traded, are there any close periods or other reasons that restrict the times when you can exercise your option and sell shares? If you leave, especially if it’s your choice, you may lose the right to exercise your option, in which case it will ‘lapse’. Some plans may allow early exercise in particular circumstances. “Good leaver” circumstances might include disability, retirement, redundancy, the business you work for being transferred outside the group (sometimes called a TUPE transfer) or the company you work for being transferred out of the group. If you die, the plan may allow your option to be exercised by your personal representatives. Sometimes, ‘good leavers’ can exercise but they have to wait until the normal exercise date. If early leavers exercised when the share price was high and but those who stay until the normal exercise date find that the share price has fallen and the option is underwater, some people might think that’s not the right result. It’s common for plans to provide that leavers only get to exercise part of their option because they only worked for the company for part of the option period. Some plans say that if you leave, (or sometimes only if you leave before a particular time) then your option will lapse, unless the directors decide to let you exercise some of it. If your option lapses, you can’t exercise it and so you can’t get any option shares- but you won’t have paid anything either. There’s no tax on an option that just lapses. What happens if there is a corporate event? The rules of the Option Plan will also set out what happens on certain company events, for instance if the company is taken over or sold. You may be allowed to exercise your option early in these kinds of situation. The company should explain what the time limits are, the choices that are open to you, what action you need to take if you want to exercise your option and what will happen in relation to the shares you get- for instance, in a take-over situation you might have to sell them straight away to the bidder. Sometimes you may be offered a rollover. How will your non-tax-advantaged option be taxed? There is no tax when your option is granted. Normally it is only when you get your option shares after exercising your option that you trigger the tax liability. Income tax and national insurance contributions will be charged, based on the difference between the exercise price you had to pay to get the shares and their market value, the amount that they are worth according to the tax rules. Your employer normally has to put in place arrangements to help sort out the employment taxes on your behalf by deducting the tax amounts through the Pay As You Earn system. It sometimes happens that you are offered money to give up your option without exercising it. You might hear people talking about paying you for ‘surrendering’ your option, or ‘cash- cancellation’. As you would expect, employment taxes will apply to the money you get. If your option lapses without being exercised and without payment, there’s no tax. The company granted options when the share price was £1. The exercise price is £1 per share and you were granted an option over 10,000 shares. After 3 years, in tax year 2018/19, the share price has risen to £2 and you decide to exercise your option. To keep this example simple, we will assume you don’t have any other shares or options or share awards. The total exercise price you have to pay is £10,000. The shares you get are worth £20,000. You have made a ‘gain’ of £10,000. Unless tax-advantaged treatment applies, this gain will be subject to employment taxes. Your employer will have to account for income tax and national insurance contributions. The tax amounts depend on your individual circumstances. For instance, if you are a basic rate tax payer and you acquired your option shares in tax year 2018/19, the income tax will be £2,000 and the employee national insurance contributions will be £1,200, a total of £3,200. The company has to pay this amount to HMRC under the PAYE system and has to recover the money from you. So, after tax, your ‘net gain’ would be £10,000 – £3,200 = £6,800. Remember, your option gain may be enough to push you into the next tax bracket, so the tax amount could be higher than the rate you are used to paying. The company might help you to fund the exercise price and the tax amounts you owe by putting in place a cashless exercise facility, see below. If the company offers a cashless exercise facility and you decide to use it, the company will arrange to sell enough of your option shares to pay the exercise price and the costs of sale. In this example 5,000 of your shares are sold at £2 per share to pay the exercise price (which is £10,000) and 1,600 shares are sold at £2 per share to cover the employment taxes (which total £3,200). We are ignoring costs of sale to keep the numbers easy. You exercised your option over 10,000 shares and you have sold 6,600 of them to pay the exercise price and your taxes. That means you have 3,400 shares left. With the share price at £2 per share, these are worth £6,800. You can keep these remaining 3,400 shares or sell some or all of them. The way the tax rules work means you do not pay income tax and capital gains tax on the same amount. So if you sell the 3,400 shares straight away you wouldn’t normally have any more tax to worry about. If you exercise an option, keep your option shares and the share price rises before you sell them, there might be capital gains tax to pay. In this example what matters is growth above £2 per share. Because you paid the exercise price of £1 per share to exercise the option and paid income tax on the option gain (also £1 per share), the taxable amount gets added to your base cost and so your base cost is £2 per share. Let’s say you sell the 3,400 shares when they are worth £3 per share. You receive £3 x 3,400= £10,200. Your base cost for these shares is £2 per share. So you make a capital gain of £3,400. Unless you have also made other capital gains by disposing of other assets, this will be covered by your capital gains tax annual exemption and you will have no more tax to pay. What if the share price fell and you decide to sell the shares for less then they were worth when you exercised your option? For instance, if you sold the 3,400 shares in this example when the share price was £1.50 per share, you would receive 3,400 x £1.50 = £5,100. There is no tax to pay. You have sold the shares for more than the £1 per share that you paid for them, but for less than the share value of £2 per share that was used to calculate the income tax on the gain when you exercised your option. For tax purposes, your loss is £1,700 (50 pence per share x 3,400 shares). You need to tell HMRC about it if you want to be able to use this loss to reduce any future capital gains tax bills. Click for more information on capital losses. What if you also have a CSOP option? If a company wants to grant options over shares with more than the CSOP limit of £30,000 it is quite common to grant as much as possible under a CSOP and then grant the rest as an option that is not tax-advantaged. You won’t always exercise both options at the same time. When deciding what to do, it is worth thinking about the tax position and being aware of the capital gains tax share identification rules. Of course, tax is not the only thing you need to consider- there may be commercial factors that are far more important. It sometimes happens that on the same day you acquire shares under a tax-advantaged CSOP and also shares under a plan that is not tax-advantaged and you decide to sell only some of them, or need to sell some of them to cover exercise price and taxes. In this situation you might want to elect to override the normal share identification rules and instead be treated as selling the non-tax advantaged ones first using the special rules for same day share acquisitions. Depending on your circumstances, doing this could avoid tax becoming due when you didn’t expect it. You are granted a share option. Once the option has vested you can choose to exercise it during the exercise period. If the share price at the time of exercise is higher than the exercise price you have to pay, it is sensible to think about exercising your option. You have to pay the exercise price. Sometimes the company will offer a cashless exercise so you can fund the exercise price and the employment taxes by selling shares. The gain on exercise is subject to employment taxes. If you are subject to the company’s share dealing code, you should consider any times when dealings will be prohibited. Click through for different information if your option is a CSOP option or a Sharesave option or an EMI option. If you need help to decide what to do, look at the Getting Advice page.